This bird is super persistent, but his cat friend reeeally doesn't want to get up so he's all like, "Blergh ... let me sleep." Sometimes you just need a buddy to wake you up, you know? 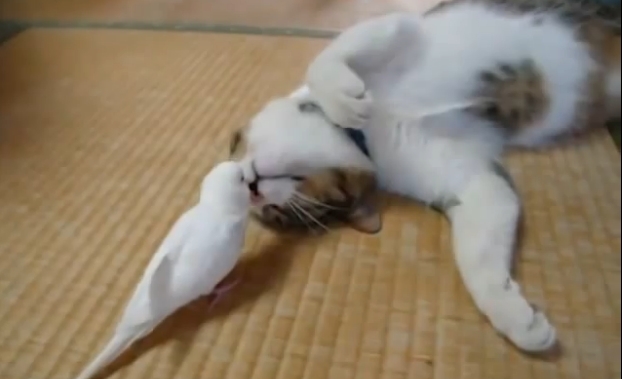 Cats are notorious loners, yet nothing will stop these extroverted birds from trying to forge a friendship. Some people are completely against even introducing birds to cats and insist on keeping their pets in separate areas of the house, and some give the animals free reign with each other. Others choose something in between. In many cases, letting the animals see each other is a good thing, because then your cat is more likely to learn that the bird is a "friend, not food." Just like people, animals have different personalities. Cats and birds may sometimes become the best of friends. Responses to "Bird Wakes Up His Sleeping Cat With Little Kisses "